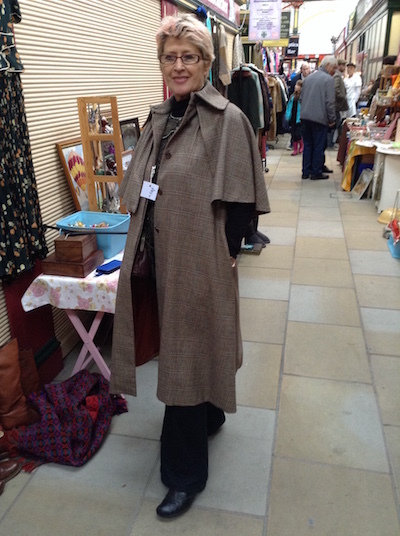 When I was asked last month to be Finder of the Fair, I had no idea what it entailed but it sounded hugely exciting. I get to find things? At the fair? Sign me up. I’m Gilly, a Stopfordian (I do believe that is the correct term) now living over’t Pennines in them thar York. 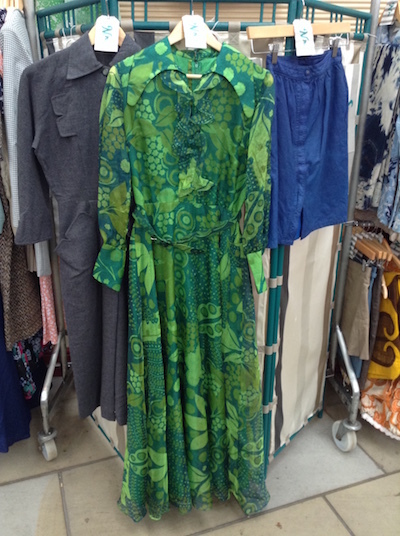 I discovered the Vintage Village just over 6 months ago on a visit to me mum’s as I am a huge 60s/70s clothing enthusiast…suffice to say my mum is seeing a lot more of her daughter these days. 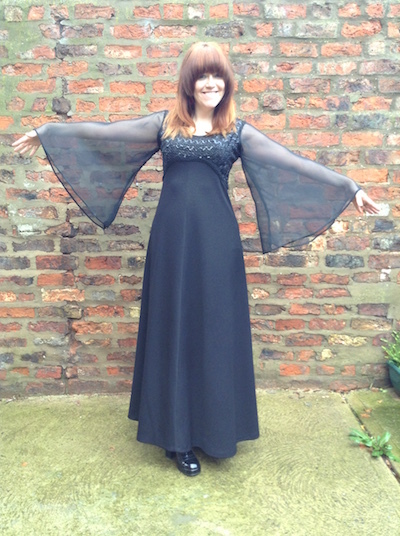 Inspired by all these lovely vintage sellers, over the Summer I decided I had far too many clothes that no longer fit my ever expanding bod, so decided to launch Silly Gilly Vintage. I sell vintage and retro style clothes and accessories via eBay so far, but who knows what the future holds? My full-time job as a primary school teacher also keeps me out of trouble. Right, onto the goodies. Call this the one who got (or crawled?) away. For £2.00 I should have snapped this up. 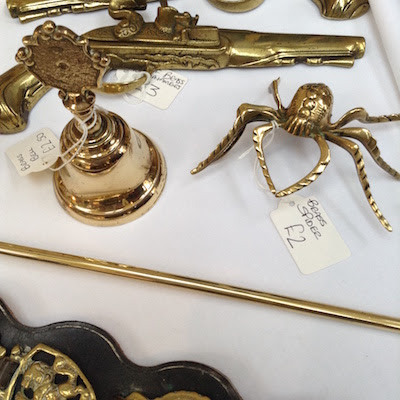 Ok, so Halloween is only just over, but whilst my mum was reminiscing about my grandma and the collection of brass bells she had on her mantelpiece, I was swooning over this little fella. Now, I couldn’t let this bargain pass me by. What screams 1980s more than a calculator? 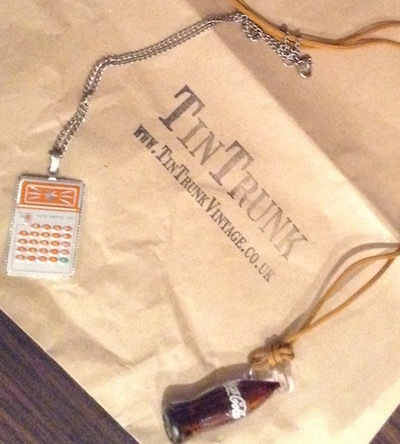 I guess these days the kids want an iPad necklace... As a lover of kitsch jewellery I have to say a fair bit of my pocket money went in this brilliant store (no, I wasn’t paid to say this) but it was also lovely to learn that this was from Sarah of TinTrunk’s personal collection. The detail is amazing, right to the engraving to form the flashing screen effect. Awesome. As a perfume lover, this caught my eye immediately. 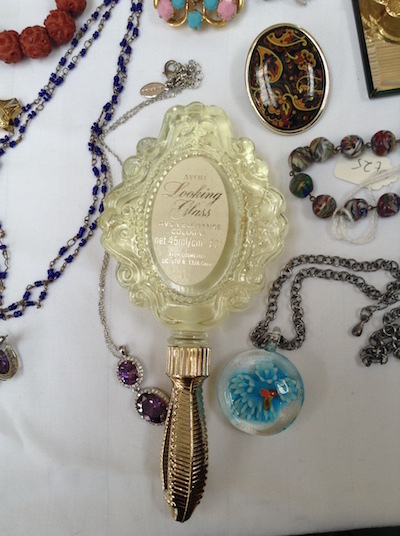 Looking a little like a hairbrush, Avon were experimental in those days and created a perfume that would look exquisite on anyone’s dressing table, with a mirror on the reverse. I regret not purchasing this but my funds were depleted at this point. Sad face. Ever the cheapskate, this has to be the bargain of the century. I have probably looked for a dress like this for most of my adult life. 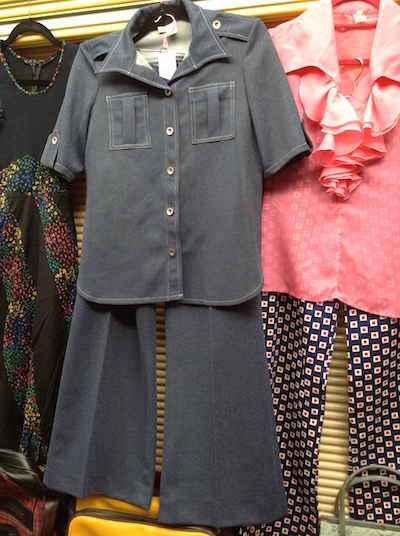 It has huge chiffon floaty sleeves. It’s a maxi dress in the most flattering cut. It has a sequinned bodice. I thought I was sorted for my works’ Christmas do. I thought wrong. THIS IS THE DRESS! The lovely Carol and Bryn of Make Do and Mend could not have been lovelier, and when I stepped out from the fitting room they seemed genuinely delighted to see their dress being ‘modelled’. I also bought a pair of genuine black 70s platforms (that got away last time) for £12.00, so for £22.00 I am totally sorted for my Christmas party. You wouldn’t get that at TopShop. 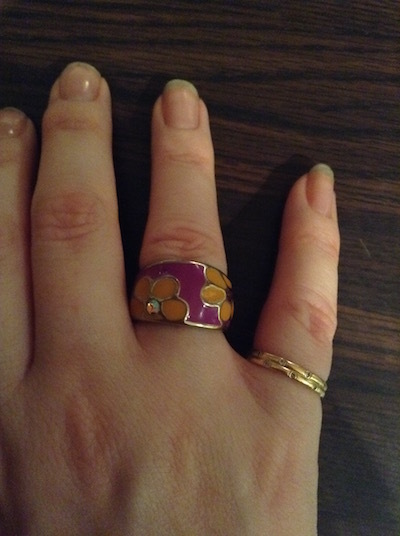 My mum felt this colourful costume ring was very me on our last visit to the fair, and being as it was still there this time it had to be purchased. Being as it was two items for a fiver, my mum made the most of this by also buying a super cute pig pin brooch. Whilst I did not have enough pennies to fork out for this beautiful specimen, everything about this dress is in my eyes, perfect. The colour, the collar, the matching belt…this is a dress for someone to feel like a princess in. Owner Rebecca was bursting with enthusiasm at her first ever vintage fair, and even showed me some of her hand-sewn Christmas stockings. Put that dress in my Christmas stocking, and you’ve got yourself a deal. If you actually want to hear more fawning over vintage goodness then come follow me on Instagram at @sillygillyvintage or on Twitter at @sillygillyvin. My eBay store is vintagesillygilly. See ya there! 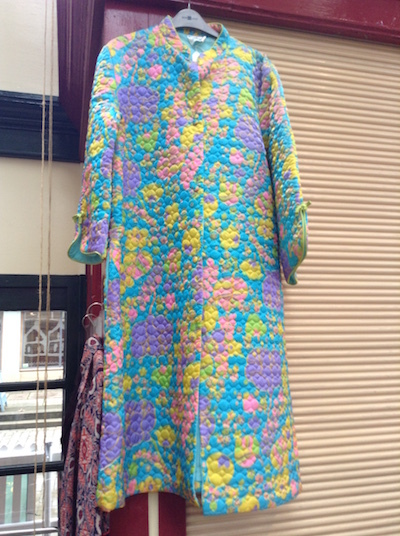 Who doesn’t love a psychedelic quilted dressing gown? 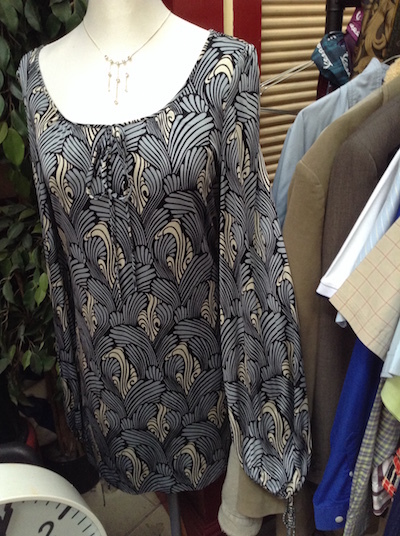 This little Slenderella number caught my eye from a height as I perused the stalls. I heard an old man laugh "Who on earth would wear that?!" which made me want it even more, until I thought on that clothes that no-one would really see me in would not be worth my pennies. 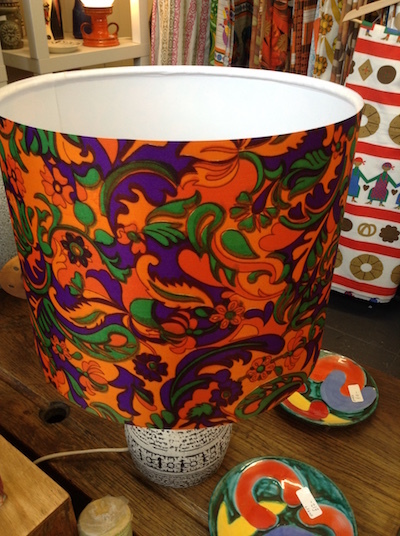 Still, for £12.00 this was an absolute bargain for a Mia Farrow in ‘Rosemary’s Baby’ wannabe. 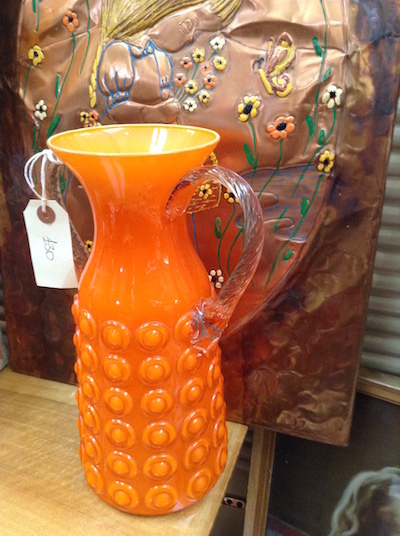 "Orange Dalek" was the extent of my knowledge of vintage glassware when I fell for this beauty, but luckily Gail of Essentially Eagle Vintage was on hand to fill in the gaps. It is an Italian Empoli encased art glass vase in the hobnail style, created in different colours with one, two or no handles. 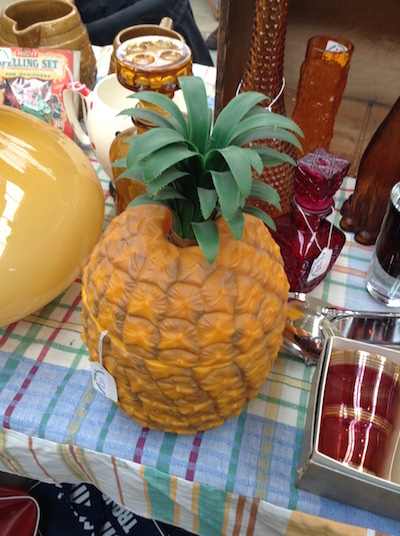 As a lover of orange, the abundance of this sunny colour is present at this fab stall so it was hard to choose a favourite thing, it has to be said. As soon as I saw this I requested the waist size in a frenzy, as flares that fit are almost impossible to come by, so give me a suit and I’m dying. But alas, too weeny. I was informed that the short sleeved jacket was initially purchased at a fair, and then a little while later the trousers were in a shop being sold by the same lady. What luck! 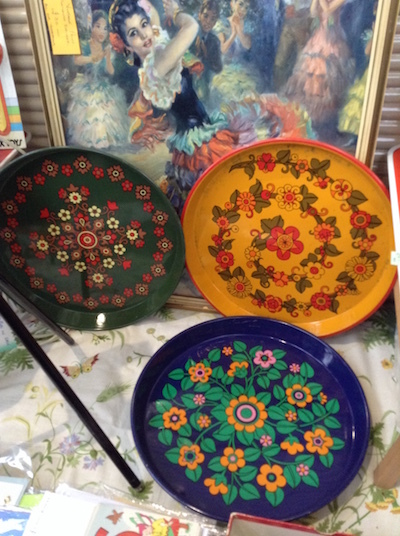 These stallholders are incidentally a lovely couple who I have purchased from at their Pear Mill Vintage Emporium outlet. Breaking away from the vintage goodies is not so hard when the delights of this lovely little haven of calm await you. 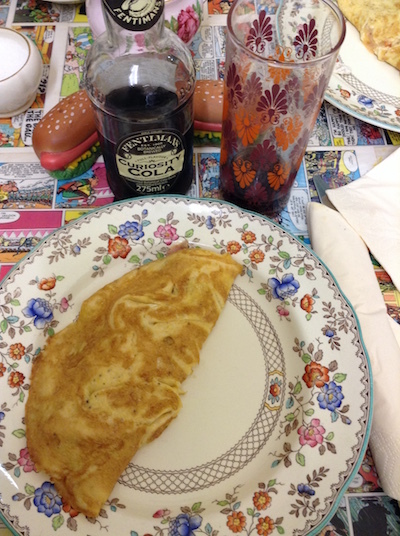 For a super cheap 3 quid you can have whatever you want in your omelette, and the extremely friendly Esther of 7 Park Street reeled off a myriad of culinary temptations. The homemade jerk ham sounded amazing, but I was allowed to try a little at first. Heck yeah! Ever a fan of Fentimans’ beverages, I was thrilled to see Curiosity Cola on the menu. Mum and I loved everything about the place; the hot dog shaped salt and pepper pots, the hippie glass, the comic strip tablecloth and the soothing 30’s music. Oh, and the food. To. Die. For. 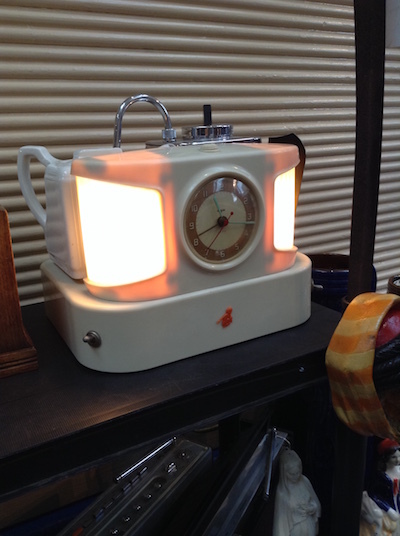 The art deco style of this took my eye, and whilst it is no longer a working teasmade (bah, tea is overrated anyway) it is a pretty cool bedside lamp. Simon of Granville’s was very knowledgeable about his goodies and told me they had modelled these teasmades as a nostalgic nod to the old Odeon cinemas of the 20s and 30s. It definitely had a touch of Van Nest Polglase’s Astaire and Rogers’ sets about it. Ah ice buckets! As a cocktail drinker I am an avid ice bucket fan, and this one took my eye in typically kitsch kitchenalia style. This seemed a good price and Rebecca from ‘Nostalgia Nights’ also found the top to make a rather interesting hat so you’ve got double the usage there. 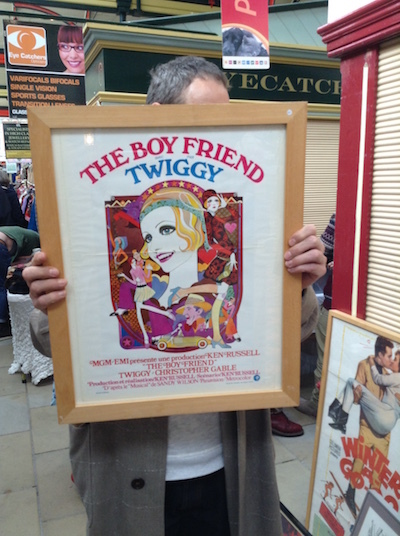 I couldn’t walk past Twiggy now, could I? But what made this Belgian poster all the more appealing to me was the film she plays in, ‘The Boyfriend’. I remember getting all dressed up as a 20s flapper and performing this on stage in my dancing days. From 1971, the whole look tallies with the direction Biba were also going in with their homage to the art deco days during this era. Ah, there had to be a Christmas mention somewhere in here. 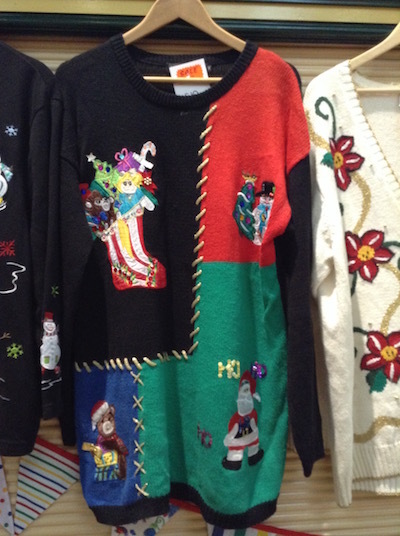 Christmas jumpers seem to have made somewhat of a comeback over the last few years, but rather than the danger of turning up to ‘Christmas Jumper Day at Work’ (oh yes, this is now a thing) in the same Next jobby, what better than to own a piece of pre-worn Christmas history? If that doesn’t convince, the sequin detailing on this is super pretty, and with a stocking full of toys, a snowman, a Santa and an Xmas ted, this epitomises all that is "merry and bright". Owner Gemma’s stall never fails to amaze me with its interesting items, and she always goes above and beyond, getting to know her customers’ tastes.